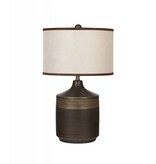 Item Description: Karissa table lamps are a tactile playground with their faux suede shades and ribbed ceramic bases. Lamps shine a bright light on sophisticated style—the perfect accompaniment to contemporary decor. 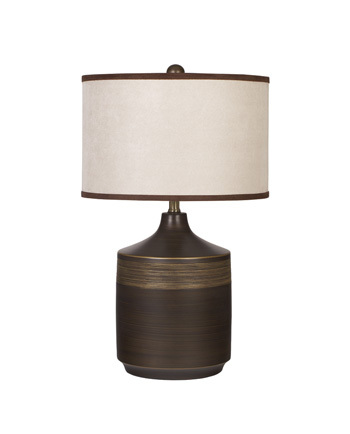 Series Features: Brown and Gold Finished Ceramic Table Lamp. Drum Shade. 3-Way Switch. Type A Bulb - 150 Watts Max or 25 Watts Max CFL.